Should my family and I exercise outside in hazardous air? Does it really make a difference? Your chances of being affected by particles increase the more strenuous your activity and the longer you are active outdoors. Children are particularly susceptible as they breathe more air per pound of body weight, so their exposure to air pollution is greater than adults. In addition, their lungs are still developing. It’s variable, but most children’s lungs don’t finish developing until they finish growing, usually around the age of 18. The U.S. Environmental Protection Agency (EPA) recommends that if your activity involves prolonged or heavy exertion, reduce your activity time or substitute another that involves less exertion. Go for a walk instead of a jog, for example. Plan outdoor activities for days when particle levels and ground level ozone levels are lower. And don’t exercise near busy roads; particle levels generally are higher in these areas. 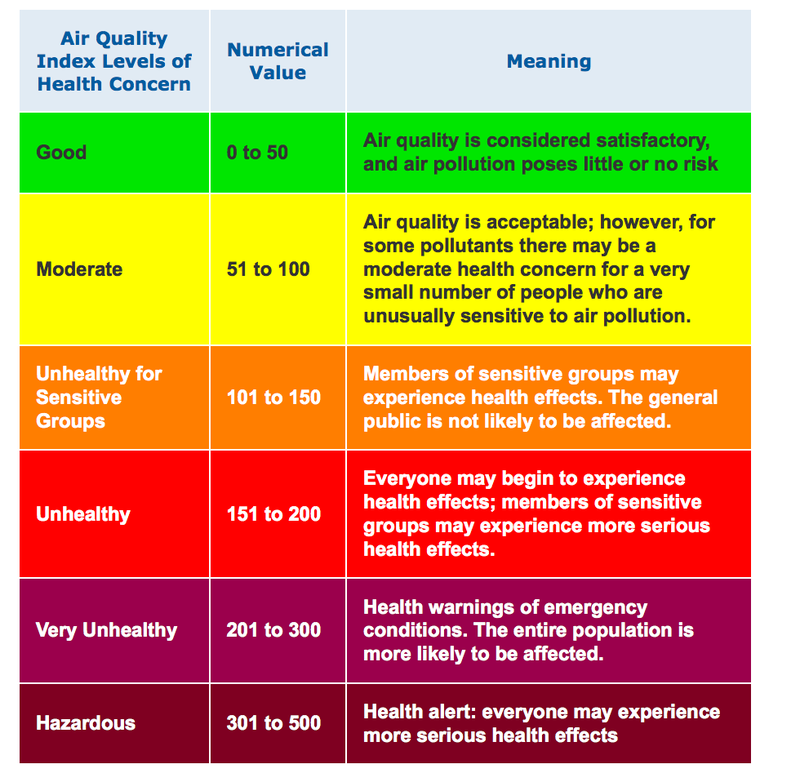 For more specific activity guidelines and health alerts at different levels of air pollution, the color-coded charts created by the EPA can be a useful tool. The charts were developed by the EPA to correspond with the U.S. system of measuring air quality, the AQI (Air Quality Index) index. In Delhi, these charts can be used with the AQI pollution measure reported from the U.S. Embassy in Chanakyapuri. You will see one number as a measurement of air pollution (the AQI) on the U.S. Embassy website http://newdelhi.usembassy.gov/mobile/airqualitydataemb.html . This number corresponds directly to the AQI options in the color –coded charts. So you can easily use these charts to see the level of health concern or activity guidelines. If you have a measure of air pollution from a different site in Delhi, for example, a raw number of P.M 2.5 levels, you need to first convert that number into an AQI before referring to the EPA charts. You can convert that number to an AQI number by using the EPA AQI calculator. The charts may look similar, and all correspond to a number of AQI but they are used to illustrate different things, so read the titles carefully. Different elements of pollution effect health in different ways, so if you are particularly interested in the effects of particulate matter or want activity guidelines for when levels of particulate matter are high, use the color coded chart that gives information specifically on particulate matter. In Delhi, most concerning is the particulate matter (both PM 10 and PM 2.5), the component of air pollution known to cause the most damage to health. For more on particulate matter see What is Air Pollution? and The Health Effects of Air Pollution. The chart below is general. It illustrates the levels of AQI measurements as each pertain to our health. 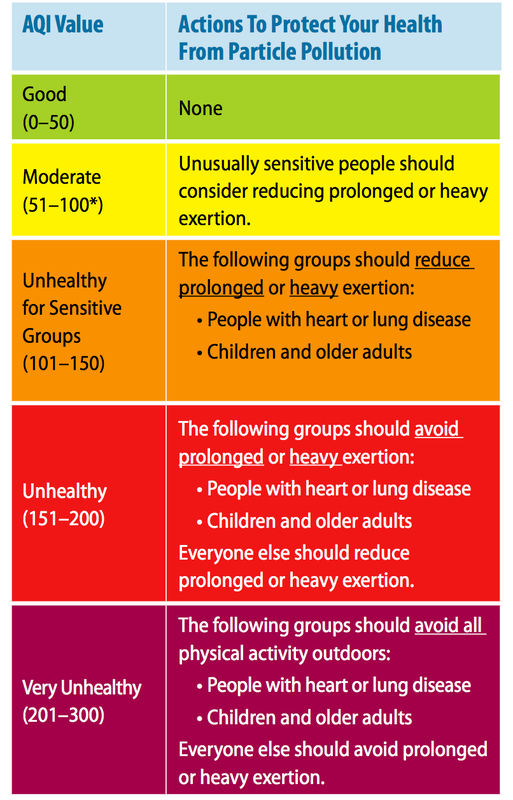 The chart below is an AQI Chart for Particulate Matter and contains recommended activity guidelines from the EPA. Notice that the numerical value used is still the AQI measure (not a raw number for particulate matter), and the advice given is directed toward the effects of particulate matter. Are there guidelines for schools? Most readily available school protocols and guidelines have been created for schools located in areas that are not considered high pollution zones. However, the U.S. EPA offers a good starting point with recommendations for managing indoor air quality and creating a strategy for bad outdoor air quality days. The EPA has created a toolkit for schools, which provides a series of checklists and information for schools to help build a framework to manage Indoor Air Quality (IAQ). The U.S. Centers for Disease Control and Prevention have put out general guideline for schools, also to use with the AQI measurements. What about schools in high pollution zones, like Delhi and Beijing? Information about school plans in India and China has been scarce and/or difficult to access. However, some extraordinary efforts have made it into the news. For example, the New York Times reported that Dulwich College in Beijing and the International School of Beijing built air-filtered sports domes over their athletic fields and tennis courts, costing $5.7 million dollars.